Gracepoint review: Broadchurch adaptation on Fox is a bummer. Gracepoint, Broadchurch, and the epidemic of sad television. Detectives Emmett Carver (David Tennant) and Ellie Miller (Anna Gunn) in Gracepoint. Television has never been more depressing than it is right now. That’s not a snide comment about the fall’s mediocre slate of new network shows—it’s an observation about the rise of Bummer TV. Bummer TV describes dramas that want to make pain, grief, and hurt a major part of the viewing experience. As prestige-seeking television has gotten increasingly grisly and lurid, it has also become ever more dedicated to exploring the painful psychological ramifications of all that grisliness. This has led to a new and simple equation: The greater the grief-to-gore ratio, the more “serious” the show. Lower the grief-to-gore ratio, and you get a network procedural. Not all shows about horrible events qualify as Bummer TV, lest you think this term can describe all TV dramas. Just ones that are particularly attentive to the experience of survivors, who may or may not be law enforcement officials. The Scandinavian version of The Killing, which was as focused on the fallout of a young woman’s death as on finding her killer, established the bleak present mood. The American version of The Killing, the British Happy Valley, the U.S. version of The Bridge and, that juggernaut of despair, The Leftovers, have perpetuated it. We are swimming in televisual sadness, high-minded shows about awful events that painstakingly lay out the long arm of trauma, simultaneously noble and about as cheerful as a corpse. Joining this set of thoughtfully intended, emotionally enervating series is Fox’s Gracepoint. One morning in a small, safe, coastal town somewhere in the Pacific Northwest, a 12-year-old boy named Danny Solano is found murdered on the beach. His death devastates his family, and their mourning is a central part of the series, unfolding alongside the investigation. The cops assigned to the case are Emmett Carver (David Tennant), a rude, haunted officer newly arrived in town, and the subordinate who was promised the job he got, a relatively inexperienced cop named Ellie Miller (Anna Gunn). Ellie is a happily married wife and mother who grew up in Gracepoint and knows the Solano family intimately. Carver, brusque and mistrustful, and Ellie, warm and too trusting—she insists everyone call her Ellie—work the case, investigating suspect after suspect, from Danny’s reticent father Mark (Michael Pena) to Nick Nolte, his voice like rancid thunder, as the long-time head of a wildlife club. For a long time, they turn up no murderers, but find sins, tragedy, and sordid backstories aplenty. As if this were not sad enough, Gracepoint is a bummer in a whole other way: It is based on a much better show. Gracepoint is the American version of the British series Broadchurch, itself a leading exemplar of Bummer TV. 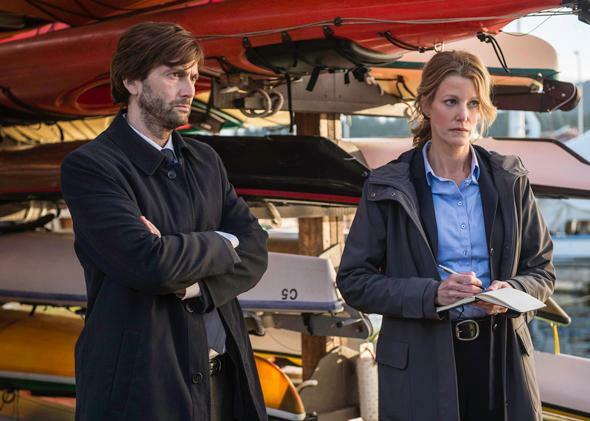 The shows are so close that they share a leading man: In Gracepoint, Tennant is reprising the role he originally played in Broadchurch. That show was a big hit in Britain, but was seen by a relatively small American audience. (Do Brits have a higher threshold for bleakness?) I am a member of that small audience, but I don’t want to harsh on Gracepoint simply because it is not Broadchurch. Gracepoint is a seriously intended, well-made drama that, for a network show, deals with heavy material in a remarkably unhistrionic or bloody way. And yet, having seen both, I can say that the seemingly slight differences between the shows push Gracepoint perilously close to failing—to borrow a phrase from New Yorker critic Emily Nussbaum’s review of Happy Valley—the “worth the pain test.” It is not quite good enough to make the suffering worthwhile. New York Times TV critic Neil Genzlinger—in a review that suggested that comparing Broadchurch and Gracepoint was downright pitiable—noted that there is “something about Gracepoint that underscores the story’s clichés: the outsider trying to crash an insular community, the damaged cop getting a new start, the warring-partners version of police work, the Machiavellian newspaper reporter conceit.” This is exactly right. Despite imitating the British original in almost every particular, something has been lost in the U.K.-to-U.S. translation. Through seven episodes there is nothing wildly different about the two shows, but Gracepoint has a facsimile’s faded quality. Something about it is less sharp, less bright, less keen, and you are left with a washed-out flier you have seen before. There has been a slight sanding down of nearly every aspect of the original in this American version. Carver and Ellie’s personalities, for example, have both been softened. In Broadchurch, Ellie was played by Olivia Colman in a much feistier, funnier, and warmer register than Anna Gunn’s interpretation of the character. Gunn’s Ellie is upset to have lost a job to Carver, but not that upset. Perhaps that’s because Carver (called D.I. Hardy in Broadchurch) is less persnickety: He’s still blunt, but he’s not quite as socially maladroit. * And without the same tension between the two, Gracepoint also lacks some necessary humor—as well as their dueling perspectives on humanity. When reviewing Broadchurch, I said that I found the show, despite its focus on a child’s murder, “spiritually salubrious.” I was impressed with the way the secrets uncovered by the detectives, unsettling as some could be, were knotty and specific. The residents of its cozy small town might not be what they seemed, but they weren’t all malevolent or vicious—often, they, too, were coping with grief. But somehow this sense of balance—that it is not just evil that lurks in your neighbor’s heart, but sadness, resilience, and love, too—is missing from Gracepoint, which really does feel like yet another series about the awfulness lurking beneath the surface of seemingly placid towns. Bummer TV is part of TV’s more general maturation. Like other arts that have come before, television now has ambitions to make the audience feel the entire gamut of human emotion, not just the fun, pleasing, escapist stuff. But if you want to make audiences feel meaningfully bad, something more than a cheap gut-punch, a show has to be very, very good. Gracepoint isn’t quite.